Pope Francis this week has met in Washington and New York with the world’s most powerful leaders, pressing them to care for the environment and the poor. Now, on the third and final stop of his historic U.S. visit, the pontiff is giving his full attention to what the Vatican considers an even more important audience: the family. He arrived Saturday morning in Philadelphia, Pennsylvania, the first U.S. city to host the World Meeting of Families. The international conference, sponsored by the Vatican and held every three years, aims to strengthen "the sacred bonds of families across the globe," its website explains. The family has been buffeted by social change, with growing acceptance of gay marriage, for instance. The Roman Catholic Church hews to its traditional definition of marriage only between a man and woman. At a midmorning Mass at the Cathedral Basilica of Saints Peter and Paul, Francis urged more than 1,200 worshipers there, as well as audiences tuned in electronically, "to reflect on our ministry to families, to couples preparing for marriage, and to our young people." He also requested prayers "for the deliberations on the forthcoming Synod on the Family." How welcoming should the church be to gay, lesbian, bisexual and transgender people? How should it treat people in "irregular" relationships, such as those living together? Should Communion be available to divorced Catholics who’ve remarried without an annulment? At the Mass, Francis asked worshipers to "transmit the joy of the gospel and to build up the church." "What are you going to do?" he challenged, citing the example of Saint Katharine Drexel. Born into a wealthy Philadelphia family in 1858, she became a nun and educator and was canonized in 2000. He called for "valuing the immense contribution which women, lay and religious, have made and continue to make to the life of our communities." Many liberal Catholics have questioned the church's male-dominated hierarchy, agitating for more roles of authority for women, including the priesthood. The Vatican steadfastly opposes women's ordination. Francis also prayed to Mary, the mother of Jesus: "May she intercede for the growth of the church." And he asked the church’s followers to pray for him. Pope Francis stumbles up the stairs to his flight from New York en route to Philadelphia from John F. Kennedy International Airport in New York, Sept. 26, 2015. Organizers of the family event greeted a slightly limping Francis when he landed at Philadelphia International Airport shortly before 10 a.m. 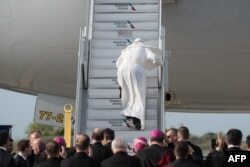 When he left New York’s John F. Kennedy International Airport, the 78-year-old pope carried his own bag and stumbled as he climbed the stairs to the aircraft – but at the top, he turned and grinned. Francis’ welcome at the Philadelphia airport included a high school band playing the theme song from the film "Rocky," which shows a boxer (Sylvester Stallone) triumphantly raising his arms atop the stairs of the city’s art museum. After the Mass, Francis headed to St. Charles Borromeo Seminary, meeting with seminarians as well people with cognitive challenges. He’s staying in a renovated dorm room at the seminary, which also is providing lodging for his entourage of 59 others, The Philadelphia Inquirer reports. In late afternoon, Francis will visit Independence Hall, a place steeped in U.S. history as the adoption site for both the Declaration of Independence and the Constitution. From a lectern that President Abraham Lincoln used to deliver the Gettysburg Address, he'll talk about the importance of religious freedom. In the evening, he’ll be serenaded by soul singer Aretha Franklin, Italian tenor Andrea Bocelli and the Philadelphia Orchestra at the Festival of Families. Sunday’s schedule sends the pope to the Curran-Fromhold Correctional Facility, where he'll meet with inmates. They plan to give him a chair, resembling a throne, which they'd made without power tools from black walnut. Francis has encouraged prison reform and the prospect of rehabilitation and forgiveness, most prominently when he washed the feet of inmates in Rome during Easter preparations. 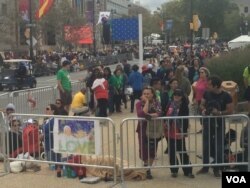 A 4 p.m. Mass on Sunday is expected to draw roughly 1 million to the Benjamin Franklin Parkway. It's the final major event before Francis' return to Rome. Sometime during the weekend, Francis also is expected to meet privately with people who were sexually abused by priests. Philadelphia, once a bastion of the U.S. Catholic church, especially has been rocked by the scandal. Its archdiocese was the focus of three grand jury investigations, the last of which, in 2011, accused it of leaving more than three dozen priests, accused of serious crimes, in assignments that might jeopardize others, the Associated Press reported. The archdiocese also has dealt with financial misappropriations and, like many others, had to close parochial schools in the face of waning enrollment and falling donations. 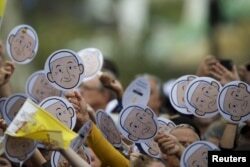 Pilgrims wave cardboard cutouts of Pope Francis before Mass at the Cathedral Basilica of Saints Peter and Paul in Philadelphia, Pennsylvania, Sept. 26, 2015.